I have been looking for a couple of wicker baskets/hampers for the past few weeks for my Christmas Eve hampers for the kids. Would prefer ones with lids but spotted these and thought they looked a good deal so ordered a couple. They can only be collected from store,no home delivery but ok if you live near one. … [img]http://www.homebargains.co.uk/Handlers/ImageHandler.ashx?id=13531&targetSize=300[/img]added picture for you. Lovely item - will check instore as its OOS online now. Xmas Eve hamper for the kids??? Not enough that they have the shirt off your back, bleed you dry every other day of your life and just a few hours later demand to be showered with overpriced designer tat, and God help you if you dare to say no just once. Getting worked up just thinking about bl**dy Xmas, can't wait till Boxing Day to get the tree down and packed away. Xmas Eve hamper for the kids??? Not enough that they have the shirt off … Xmas Eve hamper for the kids??? Not enough that they have the shirt off your back, bleed you dry every other day of your life and just a few hours later demand to be showered with overpriced designer tat, and God help you if you dare to say no just once. Getting worked up just thinking about bl**dy Xmas, can't wait till Boxing Day to get the tree down and packed away. No one said you have to take part in the tradition of christmas, if you don't like it then don't be a hypocrite. My brother hates it and does not celebrate. that is his choice and we all respect him for it. This doesn't mean he is a miserable sod, neither does he waste time moaning about it to everyone. OP thanks for putting the offer up these are just what I was looking for to fill with goodies for the special peope in my life. My missus used this last year for a hamper for her Grandad - safe to say he loved it. Great little basket that is lined with red cloth like material. Can fit quiet a bit in if you stack your items correctly too. She paid £5 for it last year in a Home Bargains store but this is best price atm so heat added. My missus used this last year for a hamper for her Grandad - safe to say … My missus used this last year for a hamper for her Grandad - safe to say he loved it. 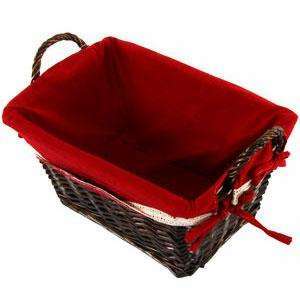 Great little basket that is lined with red cloth like material. Can fit quiet a bit in if you stack your items correctly too. She paid £5 for it last year in a Home Bargains store but this is best price atm so heat added. No one said you have to take part in the tradition of christmas, if you … No one said you have to take part in the tradition of christmas, if you don't like it then don't be a hypocrite. My brother hates it and does not celebrate. that is his choice and we all respect him for it. This doesn't mean he is a miserable sod, neither does he waste time moaning about it to everyone. My moaning is part of the tradition of Xmas. Get used to it. I collected mine today and its lovely. Medium ones are now available which look good sized so i have amended deal.